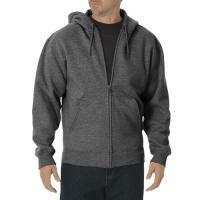 The Dickies Midweight Fleece Hoodie is warm and comfortable, perfect for working outdoors or relaxing inside. It is made from a polyester-cotton blend fleece with a textured interior that traps heat. Its low bulk also makes it easy to layer underneath a jacket for extra protection from the cold. Its ribbed hem and cuffs provide a snug fit that keeps warmth in, and the three-piece hood can be adjusted using a drawstring. Its zip front does up quickly and easily, and allows you to wear the hoodie open for more ventilation. It also includes a pair of large handwarmer pockets in the front.